Christmas Inflatables is a quick and easy way to decorate your yard for this Christmas Season! Here you will find one of the largest online selection of Christmas Inflatables and Outdoor Christmas Yard Decorations for 2018. Among the most popular items for Christmas inflatable decorations are the nylon airblown Christmas inflatables. These fun and jolly Christmas Airblowns light up for night viewing, and they can be big: some can stand up to 16 feet tall! And Standard Concession Supply features a large selection of the very popular Minion, Snoopy, Frozen, Disney Mickey and Minnie Mouse, and the New Car's 3 and Grinch Movie Christmas Inflatables! Bookmark this page and tell your Friends about all our fun Outdoor Christmas Inflatables and Lawn Decorations. Most of our inflatables are Gemmy or Air Character's Christmas inflatables. We also feature a great selection of Harvest and Thanksgiving and Hanukkah Inflatables and Holiday Yard Decorations. Christmas Inflatables also make great Birthday and Christmas Gift Items! Follow Standard Concession Supply's board Fun Christmas Inflatables on Pinterest. New 2018 Christmas Inflatable Yard Decoration..... Disney Mickey Mouse and Pluto Holiday Scene. Children's favorite everywhere Mickey with Santa hat and Mickey's trusty dog Pluto decked out with a Christmas wreath. Heart warming and adorable looking Christmas inflatable that will gather a lot of attention from both young and old alike. This Disney character inflatable stands 5 feet tall. New for Christmas 2018...North Pole Delivery Truck Christmas Inflatable. Adorable 2018 Christmas Inflatable featuring Snowman and Penguin out delivering Christmas Trees. Add some Holiday cheer to your yard this year that will delight friends and visitors This Gemmy Christmas Holiday Inflatable extends out 9 feet long. New for the Holidays 2018...10 Foot LED Snowman Inflatable. Spread some Holiday cheer with this large animated Snowman holding a Candy Cane. The Snowman head rotates back in forth as he greets all with a joyous and warm smile. This Gemmy yard inflatable stands 10 feet tall. New Christmas Inflatable for 2018....Large 12 Foot Santa Holding North Pole Sign Inflatable. Put some Ho Ho Ho in your yard decorating this Holiday Season. This 12 Ft. Santa will put some Wow into your Christmas Yard Decor. Could be a great Center piece attraction. New for Christmas 2018......Santa in Retro Truck with Reindeer Large Gemmy Airblown. Good time Christmas Holiday Scene featuring Santa at the helm with a fully decorated tree and two jolly looking reindeer. Santa is ready to greet all your visitors and passersby with some Christmas joy and cheer. Santa Truck Gemmy inflatable stands 8 feet tall. New for Christmas 2018....Santa Holding Christmas Countdown Clock Airblown Inflatable. Welcome in the Christmas Season with this 7 Foot Santa Counting Down with You How Many Days Left to Christmas. This 7 Foot Santa will count down starting from 99 days before Christmas. New for Christmas 2018....Reindeer and Santa Riding Sleigh Holiday Inflatable. Light up the night with this fun Santa and Reindeer Sleigh Inflatable. Looks like Santa and his adorable reindeer are really have a good old time. This airblown Gemmy inflatable features a scene of merriment with Santa and Reindeer Trio decked out in their Holiday garb and enjoying some Holiday fun on their new sled. For Indoor and outdoor use. Heartwarming and very adorable new 2018 Christmas Inflatable Bear has popped out of Santa bag and is checking out his new home. This inflatable is animated as our adorable bear pops his head in and out of the Santa bag. This Christmas Inflatable stands 4.5 feet tall. You will hear lots of ooohs and ahhhs as friends and passersby see this one. New Gemmy Disney 2018 Christmas Inflatable ....Mickey Mouse Greeter. Mickey is all decked out in a in his Santa hat and Holiday outfit of red and green ready to celebrate the Holidays with you. Mickey is standing 6 feet tall and has a big Holiday Smile that will give a warm welcome to visitors and guests. Add some holiday cheer this Christmas 2018 to your yard decorations with this handsome dapper looking Mickey. New from Gemmy for Christmas 2018....Minnie Christmas Inflatable . This Disney Inflatable features Minnie decked out in her Christmas best. This adorable and cute Minnie Christmas Inflatable will be loved by young and old alike. Put this inflatable close to your home entrance or in the middle of your decorations as Minnie will greet all visitors with Christmas cheers and greetings! Minnie inflatable stands 6 feet high. Welcome in the 2018 Christmas Holiday Season with this new 2018 11.5 Foot North Pole Arch Pathway Christmas Inflatable. This arch pathway inflatable would make a great gateway to your Holiday event, or entry to your home yard decorations, or even would be a great centerpiece to your home yard decor. You will have Santa, Snowman, and Penguin all welcoming and greeting your Holiday and Christmas Day guests. This North Pole Arch Inflatable is 8 feet tall and 11.5 feet wide. New Nutcracker Bear Inflatable for the Christmas Holiday Season. This gorgeous looking bear is featured here with a Nutcracker outfit and with plush fabric accents. This Gemmy Christmas Bear Inflatable is an eye catching and colorful Christmas Inflatable. Kids of all ages will love this one! Large Christmas Inflatable extends 6 feet wide and 7 feet tall..
New Fun Christmas Inflatable for 2018.....Santa with Reindeer Rowboat Scene. Santa is at the helm with Team Santa hoping to get some gifts delivered on time. Looking to give a good ho ho ho laugh this Christmas Season, then this inflatable is for you. Super size your Holiday Decorating with this 10 foot long OC Christmas Inflatable..
New for 2018....Santa Clause Farm and Animal Scene Christmas Inflatable. Large and adorable 9 foot Santa Farm Scene will be a favorite of both children and adults alike. The inflatable features Santa decked out in his farm clothes with his favorite farm animals. ..and Santa greets and welcomes all with some big Holiday Cheer. Easy to set up and decorate for the Holiday Season. Look who is coming to town from their annual Christmas Tree Journey......It's the famous Griswold family in their station wagon from the National Lampoon's Christmas Vacation. Add some serious fun to your Christmas decorating this year with this mew 2018 8 foot long Christmas Airblown Blowup. This inflatable does have internal lighting which will help light up you Holiday Nights. Gemmy New 2018 Holiday Inflatable....The Waggin Puppy Dog Scene Inflatable. One of the most anticipated inflatables for the 2018 Holiday and Christmas Season. Very Adorable Holiday inflatable that features 3 very cute puppies decked out with Santa hats inside a wagon and a larger dog hanging out with the 3 pups. Hearts will melt with both children and adults alike with this almost 7 feet wide whimsical Holiday yard decoration. New for Christmas.....Never before seen Christmas Design Inflatable....Candy Train Christmas Inflatable with Gingerbread Man as the conductor. Wow...you get a lot candy train for your money on this one...this train extends out 14 feet wide! Great center piece for the your Christmas yard decorations. Kids will love this one! Bright and colorful inflatable will definitely brighten up your yard for the Holidays. So get on board and grab this one for the 2018 Christmas season! New for 2018....Santa Sleigh Christmas inflatable. Santa Sleigh with 3 Reindeer scene Christmas inflatable created by Gemmy. Great Sleigh Scene for all ages. This Colossal Santa Sleigh with Santa's famous reindeer would be a great centerpiece for your yard and would be the talk of the neighborhood and your Holiday guests. Ho Ho Ho! This Christmas Inflatable extends out 16 feet wide. New Christmas Inflatable for 2018..... Santa's Workshop Helper Elf with Santa Stop Here Sign. Adorable looking Elf with candy cane and sign will delight neighbors and friends. This large Christmas inflatable is over 8 feet tall and 5 feet wide. New for the Holidays 2018....Mickey Mouse featured on the Steamboat Willie Holiday Inflatable. Help Celebrate Mickey's 90 Birthday. Mickey is definitely in the Holiday spirit as he is decked out in a Santa hat and has the boat decorated for the Holidays. Another great Disney inflatable to help you Mickey fans to ring in the Holiday Season with much fanfare. This adorable Mickey Inflatable will grab the attention of all passerby! This Disney Christmas Inflatable extends 5.5 feet out and 7 feet tall. Grab this one today before it sells out. New Christmas Inflatable for 2018.....Barnyard Farm Animals Light Show. Adorable and cute Farm Animals Synchronized Light Show Playing Holiday Children's Moosic This inflatable will indeed be a hit with the kidos. This Airblown® Inflatable sets up in seconds and inflates to be over 6 ft. wide. New for Christmas 2018....Marshall and Chase on Sled Nickelodeon Christmas inflatable. Very adorable Holiday Christmas Scene featuring Paw Patrol Marshall and Chase in a sledding scene. Children will certainly love and delight seeing these Paw Patrol characters your yard this year with this Holiday Sled Scene. This Nickelodeon inflatable stands 5 feet tall and 5 foot wide and both are ready to celebrate the Holidays with you and your guests and visitors. New 2018 Christmas Inflatable....Santa Wagon Scene with Penguin and Christmas Tree. Looks like Mr Penguin volunteered for something he is now regretting. But Santa is ready to greet all your visitors and passersby. Add some humor and fun to your Christmas decorating this year. This good time Holiday Inflatable is 7.5 wide and 5.5 feet tall. New 2018 Gemmy Holiday Inflatable....Do Not Feed The Bears Animated Inflatable. Looks like this bear might be a bit more friendly Polar Bear. The Polar Bear head moves from left to right as he is enjoying a candy cane. This Polar Bear inflatable extends 6.50 feet wide. New 2018 Christmas Inflatable....Gemmy Animated Peanuts Snoopy and Woodstock Zamboni Scene Inflatable.....Snoopy and Woodstock are on their new Zamboni "Making The Ice Nice" for skaters for the Holiday Season. Never seen before design and style Christmas Inflatable. This inflatable will be the hit of the neighborhood and will bring lots of Christmas cheer and merriment to the neighborhood. This inflatable is 9 feet wide. and 7 feet tall. In addition, this inflatable is animated as Snoopy shakes and shivers in the drivers soon. A definite inflatable for you Snoopy and Woodstock fans and fun loving Christmas folks! New Gemmy Christmas Inflatable for 2018...Santa in a Vintage Style Helicopter. This Large 8.5 foot Santa Helicopter Scene Christmas Inflatable will brighten up your yard and your neighbors as they pass by. Santa is featured here behind the control panel, and his helicopter is animated with spinning propellers. Internal lights to present a glowing night time display. New for 2018....Nativity Christmas Scene Inflatable. 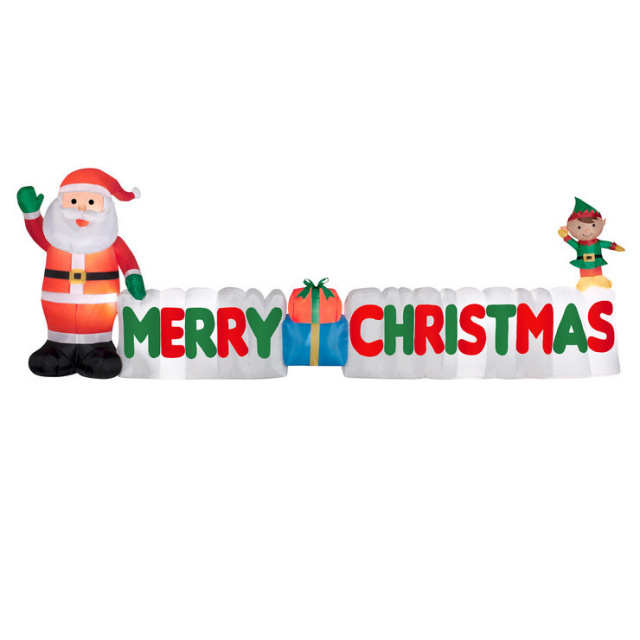 This Adorable Gemmy Inflatable will help you celebrate the Reason For The Season and will add to the Christmas spirit to your outdoor Christmas decorations this year. This outdoor decor inflatable has a greeting on the inside "Oh come let us adore Him". Will definitely be enjoyed by the kidos. This Gemmy Christmas Inflatable stands about 6 feet tall and 4.5 feet wide. Something New and Unique for this 2018 Christmas Season. Santa Featured with a Clydesdale Style Sleigh. Wow...Gorgeous looking Horse with Santa Clydesdale Sleigh Scene. And this head turning Christmas Airblown Inflatable extends out 9 feet Wide. Has realistic looking soft plush fabric for the manes, tail, and hoofs. Will be definitely catch the eyes of all passersby. Young and all old will enjoy this one. New Christmas Gemmy Inflatable for 2018. Wow...This inflatable features Penguins flying in their new animated helicopter that extends out 9 feet. Hope all will be safe. Entertain guests and visitors with this fun and good time Holiday Christmas Scene. Internal lights will help brighten up the Holiday Season! Stands over 5 feet tall and extends out 9 feet long. Would make for a great center piece. New and unique Gemmy Christmas Inflatable 2018. Looks like Santa and Penguins are busying preparing some Taffy for all the kids from their whimsical North Pole Taffy Shop. Santa Rocks back and forth. Kids will love this one. Tis the season to be jolly! Colorful Inflatable has a length of 7.5 feet long and 7 feet tall. Will be a hit in your neighborhood this Christmas Season! New Awesome 2018 Gemmy Christmas Inflatable....10 Foot Tall Candy Castle. One of the most anticipated Christmas Inflatables for the 2018 Holiday Season. Bring some ooonhs and ahhhs to your 2018 Christmas Yard Decorations. This very awesome and colorful castle features an adorable penguin, reindeer, and ginger bread boy. This Castle features a light up ball at the top of the Castle that will definitely light up your Christmas Nights and will be the talk of the neighborhood. Grab this inflatable before this one sells out. This Santa Candy Castle Inflatable stands 10 ft high and 10 feet long. Santa Camper RV Scene 2018 Christmas Inflatable. Santa and Penguin friends are trying their hand at glamping. Santa is animated as he pops in and out of the camper door. Great Christmas decoration for you campers and lovers of the outdoors. Order this one early as it to sure sell out early. Almost 9 feet wide and as well as tall Christmas Airblown Inflatable. This inflatable will be a lot of fun. New Gemmy Airblown Inflatable for Holidays 2018....8 Foot Wide Inflatable Kaleidoscope-Dragon. Awesome looking giant Dragon Christmas Airblown will be the talk of the kids and adults in the neighborhood. This Colorful Dragon features projection lighting that swirls and sparkles, bringing a dazzling look to your yard. This Dragon is holding a gift and is ready to celebrate and will light up your Holiday nights and will be enjoyed by young and old alike. New Minion Mailbox Scene Holiday Inflatable. This inflatable features an adorable Minion Character that is ready to send Santa Claus his Santa list via the North Pole Mail Service. This inflatable stands 4.5 feet tall. Let this lovable Minion greet your friends and neighbors. This Christmas Inflatable will be a highlight in your neighborhood this Holiday Season. New 2018 Christmas Inflatable .....Santa with A Wheel Barrow Full Of Puppies. Santa is featured with some adorable puppies. Dog lovers everywhere will fall in love with this adorable Holiday Inflatable. This inflatable stands 7 feet high. Tis the season to enjoy and celebrate! New for Christmas 2018....3 Kings Christmas Inflatable. Very colorful Christmas inflatable featuring a traditional reflection of the Christmas Season....The 3 Kings Bearing Gifts.From The Orient For The Baby Jesus. This airblown inflatable stands 5.5 feet high. New Gemmy Christmas Inflatable for 2018.... Santa on Large New Tractor with Gifts. We are sure the elves could use this tractor, moving all the pallets of gifts around the North Pole. Great Christmas Inflatable for any farm area, farm show, nurseries, garden shows, or for those who love gardening and the great outdoors. Santa is wishing a big hello and Christmas cheer to all. Brighten up the Holidays with this large 8.5 feet long Tractor Inflatable with Santa and a tractor full of gifts... This inflatable is great for indoors as well as outdoors. New Christmas Inflatable for 2018....12 Foot Santa Circus Train Inflatable. Another highly Anticipated Inflatable for the 2018 Christmas Season is here. Deliver some Holiday Joy and Cheer to all passersby with this awesome 12 Foot Santa Circus Train with Lion and Giraffe. Santa is featured with mix media plush material and the lion's head is made of similar material. Will make for a great centerpiece yard decoration, and this awesome looking train will be the talk of the holiday season! New Christmas Inflatable for 2018.....7 Foot Lighted Joy Christmas Stocking With Teddy Bear . Adorable Holiday Inflatable featuring a Teddy Bear in a stocking with gift and candy cane. Spread some joy and cheer this Holiday Season. This Gemmy inflatable lights up. Max and Grinch are prepping for their new movie this November 2018. Grinch is decked out in his Santa suit with his old trusted friend Max ready to create some havoc on his friends below. Celebrate the Holidays with The Grinch and Max in your yard for 2018! This new 2018 Gemmy Christmas Inflatable extends out 6.5 feet long. New for Christmas 2018... Santa In A Gingerbread Animate Airplane. Santa is feeling a bit whimsical flying in his new Gingerbread Airplane. This Gemmy Yard Christmas Inflatable extends out 7 feet long, and features an animated candy cane propeller. Charm your neighbors, guests, and passerby with this new adorable Santa Airplane Scene this 2018 Holiday Season. The display collapses easily at the end of the season for no-sweat storage and self-inflates in seconds when it is time to show some holiday cheer! New 2018 Christmas Inflatable....Attractive Looking 7 Foot Tall Santa Workshop Lamp Post. This adorable Light Post Airblown Yard Inflatable is adorned with a Santa hat and lights up for night time illumination. Multi purpose uses for different events or for yard decor for the Holidays. Grab this one today to be the first to have this for the 2018 Holiday Season. Meerkats with Gift Christmas Inflatable New for 2018.....3 Amigo Meerkats are showing off their Holiday Gift Set and ready to celebrate the 2018 Holiday Season in your yard and spread some holiday joy to your visitors and passersby. This colorful inflatable stands 5 feet tall and will bring maximum party & holiday cheer to the neighborhood. Suitable for indoor or outdoor use. Create a glowing night-time display with the included internal lighting. New 2018 Christmas Inflatable... Large Santa on Motorbike with Stuffed Bear. Supersize your Holiday and Christmas decorating with this approximate 6.5 feet Gemmy Christmas Inflatable. Very adorable and heartwarming Santa on a motorcycle with a large plush fabric bear will help light your Christmas nights and add some Christmas cheer. This inflatable includes internal lighting. New Air Character Christmas Inflatable for 2018..Look out....Santa in a Firetruck with ladder with Reindeer in driver's seat . All you folks in fire and other protective services, celebrate the Christmas Season with this nicely designed Santa Firetruck scene in your yard. Make a statement with this 7 foot long Fireman Santa Airblown Inflatable. Comes with a strong external blower to inflate the Airblown and keeps it inflated. Internal lights create a glowing night-time display. New 2018 Christmas Inflatable. This beautiful Church and Angel inflatable will be an eye catcher to all who pass by this Christmas Season. The attractive Christmas Church Scene will be a reflection of peace, joy, and good will to all this Holiday Season. This Gemmy inflatable stands about 7.5 feet high. New Christmas Inflatable for 2018...... Very large 17.5 Foot colorful Gemmy Santa Sleigh with 9 Reindeer Airblown Inflatable. Will make a great centerpiece Christmas yard decoration..And, Rudolph the Rednose Reindeer is leading the team. So Share the Christmas Joy with all this Christmas Season with this awesome looking 17 Santa Sleigh Inflatable. Lights up for a great nighttime illumination. New 2018 Very Large Adorable Snowman Holiday Inflatable. This Jovial Looking North Pole 10 Foot Snowman features Kaleidoscope lighting technology. The body of the snowman displays a brilliant nighttime swirling lighting effects. Grab this snowman at this very special price today. New for Christmas 2018.....Grinch with Stocking String Christmas Scene Inflatable. All you Grinch fans....Add to your Holiday yard decorating with this mischievous looking 6.5 foot Dr. Seuss Grinch Holding Stocking String Christmas Inflatable. Grinch is decked out with his Santa Hat and Jacket. New Christmas Inflatable for 2018...Santa in 10 Foot Bass Boat. Looks like Santa is doing some R&R and has caught a nice looking bass and wants to show off to everyone. Add some fun and joy to your Christmas and Holiday yard decorations this year with this Santa Fishing Christmas Inflatable. New for the Holidays 2018.... Santa's Holiday Camper Airblown Inflatable. Santa is taking some R&R from his busy Holiday Christmas schedule. What a better way to take a break than some camping. Santa is featured here wishing all Christmas joy and greetings as he pops in and out of his Holiday camper all decorated for the Christmas season. This Santa Inflatable camper scene stands 6 feet tall. New for Christmas 2018....3 Stacked Penguins Mailbox Scene Christmas Inflatable. Looks like our Penguins all have each written their Christmas wish list to Santa, and they are dropping their Santa Lists in the special North Pole Mailbox. . Very adorable Penguin Scene Inflatable stands 6 feet tall. Create some heart-warming Christmas Joy and brighten up this Holiday Season with this unique and beautifully designed Gemmy Christmas inflatable. Internal LED Blinking Lighting will brighten up your Holiday nights. New Gemmy 2018 Christmas Inflatable...Ralphie From The Christmas Story Movie in a Pink Bunny Suit. We all remember this part of the movie quite well. What a way to add some fun and laughs to your Christmas decorating. Ralphie's fuzzy pink bunny suit is includes plush fabric Put some smiles on the faces of those who pass by your yard this Holiday Season with this adorable Warner Brother's Ralphie Inflatable. This airblown inflatable stands 6 feet tall. New from Gemmy for Christmas 2018....6 Foot Church Inflatable with LED illumination Rustic traditional church reflecting on past Christmases. This church is designed with the traditional steeple and stained glass windows. Can be a great addition to your angels, carolers, candles, or other Christmas theme decorations. This Church Christmas Inflatable stands 6 feet tall. New for the Holidays 2018....54" Playful animated Puppy Dog Inflatable. Colorful fun and playful Puppy Dog that shakes and shimmers. With the Puppy Outfitted in festive green and red hues, your holiday display will be everybody's favorite with this cutie. Inflatable extends out 4.5 feet long. New for Christmas 2018...Lighted Candle Scene Christmas Inflatable. Ring in the Christmas and Holiday Season with this beautiful set of 9 Candles Wishing all your neighbors Merry Christmas Airblown Inflatable. Light up the night with this awesome looking large Gemmy Christmas Inflatable that extends 9 Feet wide by 6.5 feet tall. New for Christmas 2018....Snoopy has a larger doghouse where he and Woodstock are in the gift giving spirit. Snoopy's new doghouse is 8.5 feet high. Snoopy is wearing a Santa hat, and Snoopy has decorated his doghouse with a Christmas tree to boot for the Christmas Season. New 2018 Christmas Inflatable for Grinch Lovers everywhere....Large 6 Foot Grinch and Max with Santa Gift Bag. Looks like The Mischievous Grinch got what he wanted from Who-Ville with his Santa bag full of presents. Lights up and will create a night time illumination in the night. New Gemmy Holiday Inflatable. This year add some merriment to your Holiday Decorating with this very adorable Rocking Horse Scene. This new Holiday Design will bring a unique look to your indoor or outdoor decorating. This inflatable extends out 6 feet wide. This the Season to Be Jolly! New Holiday Inflatable back for 2018...Polar Bears on Slide Scene.. Looks like these Polar Bears are having good old time on this 9 foot slide. These adorable polar bear cubs, complete with hat and scarf as they play on a slide, will be a huge hit in your neighborhood this Holiday Season. Very adorable new 2018 Christmas Polar Bear and Santa Penguin Scene Inflatable. This cute penguin is having quite a time fishing on the back of this polar bear. It does look like the Polar Bear in enjoying the Holiday fun as well. Penguin and Santa has internal lighting to enhance the night time visuals. This Gemmy Christmas inflatable extends out 6.5 feet long. New for the Holiday Season 2018....Photos with Santa Christmas Scene. Adorable Elf and Santa are ready to spread some Christmas cheer this Holiday Season. Step right up and get your photo with Santa. Looks even better in person. Outstanding quality. This Gemmy inflatable stands 10 feet tall. Plush mix media fabric used on this inflatable. New from Gemmy for Christmas 2018....Santa Grinch and Sleigh with Max Christmas Inflatable. Old Mr Grinch has caused some havoc in Whoville with his dog Max and large sleigh. The Grinch's sleigh is full of gifts and decorations. This Dr Sues large inflatable will definitely garner some attention this Christmas season and will entertain guests and visitors alike, The Christmas inflatable stands 12 feet high. 11 Foot Gemmy Mickey Greeter Christmas Inflatable. What a great way to decorate your yard this Holiday Season. Supersize your Christmas Inflatable Decorations with this Adorable Disney Mickey Holiday inflatable. Mickey is decked out in his Santa Hat and wishes large Christmas greetings to all. Official Walt Disney licensed product. New Holiday Inflatable for 2018....3.5 Disney Minnie Inflatable. Let this adorable Minnie bring some Holiday and Christmas Cheer to your yard, home, or other Holiday location. New for Christmas 2018....5 Foot Wiener Dog and Puppy Pals Christmas Inflatable. Adorable 5 foot LED Lighted Plush Material Wiener Dog and very Cute Puppy Dog Pals all decked out in their Santa hats and scarfs. Delight your guest and visitors this Holiday Season with this Dog and Puppy Scene. New Christmas Inflatable .....Santa in His Green Chair for Photos with Penguin and Elf. Santa wants to know what these two fellows want for Christmas and a photo with Santa to boot. Inflatable stands 6 foot tall. Add some merry to your holiday decorating with this Santa photo scene. New Christmas Inflatable back for 2018....Puppies Sharing Candy Candy Scene. Wow...talking about adorable....These puppies are very adorable. This inflatable is quite large at 8 feet wide and 4 feet long. Children and Dog Lovers will fall in love with the Christmas Yard Decoration. The Grinch is back for 2018....New Santa Grinch Christmas Inflatable. The Grinch has been on Sabbatical. Our old Christmas friend is back to bring some mischief and Christmas cheer. He even has a new movie this year in November. This Dr Seuss Grinch Christmas inflatable stands 4 feet tall. Great way to say Happy Holidays to guests and neighbors. Very Adorable New Christmas Inflatable..... Mickie and Minnie Clubhouse Panoramic Projection Holiday Scene . New Christmas Inflatable that will grab the attention of young and old everywhere. Globe features rotates around. Cute Disney Inflatable stands 6.5 feet tall. Eye catching Christmas Airblown. Click on link to see video. Snowman with Jr Snowmam Animated Christmas Airblown Inflatable. This large 10 Foot Gemmy Holiday Airblown Inflatable will brighten up the yard as the Baby Snowman Pops In and out of Dad's Snowman Hat. Features cool swirling kaleidoscope lighting effects. This inflatable will be great fun all Holiday Season! New Christmas Inflatable by Gemmy.....Christmas Inflatable features Santa in his new awesome large 9 foot Christmas Tree Delivery Truck. And, Santa has some trusty reindeer helpers. Santa wants to greet all your Holiday visitors from his new pick up truck. Easy to set-up and easy to store, simply unplug and deflate. New for the Christmas Holidays 2017...Santa Grinch with Gift Inflatable. What is this crafty looking Grinch up to with a present in his hand. This Grinch Holiday Inflatable Airblown stands 4 feet tall. Heee's Back! From the Blockbuster Movie Cars 3...Lightening McQueen with Christmas Tree Inflatable. Colorful Large 7.5 Foot Gemmy Christmas McQueen Car inflatable. McQueen is ready to celebrate Christmas and the Holidays in style with a large freshly cut Christmas Tree Will be the talk of the neighborhood. Internal lights will light up the night. Guaranteed hit this Christmas for all you Cars fans. From The Disney Cars 3 Movie...Mater is making a return for Christmas 2018...He does not want to be left out of all the 2018 Holiday Fun. Gemmy Airblown Christmas Inflatable.... Features Mater with Reindeer Hat and Present. This Disney Mater extends out 6 feet long. Disney Mickey and Minnie Under The Mistletoe Christmas Inflatable. Cute and very adorable Mickey and Minnie Mouse Inflatable. Mickey is holding something special over Miinnie's nose. Both are decked out in their Holiday garb and are ready to celebrate the Holidays with you and family. Extends out 5.5 feet long.. Put a smile on the face of both young and old alike with this Mickey and Minnie Mouse Disney Inflatable. New Christmas Inflatable for 2018..... Santa Bowling Holiday Airblown. Looks like Santa has some Penguins pretty nervous. If you are looking to add a some humor and fun to your Christmas decorating this year, this Santa Bowling Scene will be for you. This large Christmas inflatable extends out 10.5 feet long. New for the Holidays ......Ring in the Holiday Season with this large joyous and adorable Snowman Family Scene with Presents. Snowman dad, mom. and the 2 little ones all have the arms up giving warm Holiday greetings to your neighbors and passersby. This Gemmy Christmas Inflatables extends 9 feet long. Snowman Light Show Marker with music........New fun Snow Man Holiday Gemmy Inflatable. Light up your Holiday Season with these 3 Adorable Snowman ready to play some Holiday Cheer as they greet your visitors and neighbors. Large inflatable extends out 8 feet. Golden Labrador with Blinking Eyes. The new and very uniquely designed Christmas inflatable features a very adorable Golden Labrador whose eyes blink in motion. This Labrador is decked out in his Santa hat with his Stocking "I Believe In Santa Paws" This inflatable stands 6 feet tall. New Gemmy Christmas Inflatable featuring Santa Grinch Rooftop Chimney Scene. Our crafty Mr Grinch all dressed up in his Santa outfit is determined to steal Christmas in Whoville. This Grinch inflatable is animated as Grinch pops in and out of the chimney. This Gemmy Dr Sues inflatable stands five and a half feet tall. Your holiday guests will be entertained by this Mr Grinch inflatable and will certainly will bring back some fond movie memories. Ho Ho Ho! New 7 Foot African American Santa Holding a Gift Christmas Inflatable. Great Holiday Santa greeter for all your Christmas gatherings and parties. For indoor or outdoor use. Lights up for a great night time glow. New for Christmas 2018...Animated Christmas Tree Yard Inflatable. Looking for a fun and good times Christmas Inflatable...then this 9.5 foot tall cute inflatable is for you. This Christmas Inflatable features Santa, and his friends Snowman, Penguin, and two Reindeer. The right reindeer is moving his head back and forth. And this tree has kaleidoscope lighting on the tree. Stands 9.5 feet tall.. Spread some Holiday cheer in your neighborhood with this new Animated Tree and Reindeer Airblown Blowup..
New Inflatable for the Holidays......8 Foot Snowman Christmas Inflatable with Holiday hat and scarf. Supersize your Holiday and Christmas decorating with this authentic looking snowman.....This snowman has giant smile on his face as he is ready to spread some holiday cheer to all your neighbors and passersby. Heartwarming and very Adorable Snow Man Family including Snowman Junior Holiday Inflatable. This darling Inflatable features our Snow Man Family wishing all Holiday Greetings and Junior ready to present a gift. This snowman family is decked out in their Holiday Garb and ready to celebrate the Holidays with you! Four foot Holiday Inflatable. New Yard Decoration for the Holidays....3 Stacked Snowman Yard Art. Decorate your yard this year with these adorable 3 Snowman Decoration. These jolly snowman will bring some Holiday cheer to your yard this year. These stacked snowman stand 42" high.. Greet your Holiday guest with this attractive 3 snowmen yard art this 2018 Holiday Season. Holiday Christmas Bonus: With The Purchase of the Stacked Snowman, you will receive Free 5 Solar Snowman Pathway Markers Listed Below. New for the Holidays......Solar Snowman Pathway Light Stake. These cute snowman pathway markers are all donned in their Snowman Hats with a big smile to greet all your Holiday visitors. These individual snowman stakes stand 14" high. No electricity needed. New Holiday Inflatable for 2018....Paw Patrol Chase. One of Childrens' Favorite Characters from Nickelodeon....This very adorable Paw Patrol Chase ready to send his Wish List of to Santa. Chase stands 42" high. Lights up to create a night time glow. Great indoor or outdoor use. New Christmas Yard Inflatable Decoration.....Lighted Gingerbread House that is adorable and eye catching This Large 9 Foot Wide Animated Gemmy Gingerbread House will be the hit of the neighborhood as Santa pops out of the window. Let the magic of Christmas come alive in your yard this 2018 Holiday Season with this beautifully designed Gingerbread House. New Christmas Inflatable for 2018. Santa has pulled out his new Present Patrol Helicopter to make his visits around town. This helicopter is animated and features two penguins helping Santa with the gift giving. New Gemmy Christmas back for 2018....Santa Feeding His Reindeer Christmas Inflatable. Looks like Santa has his hands full with some famished and hungry reindeer. This time Santa has a sack of reindeer feed on his shoulders and ready to spread some reindeer cheer. Three of the deer are animated. These 3 move their heads up and down. This Colossal Christmas Inflatable extends out 16 feet long and will be the talk of the neighborhood. Makes for a great centerpiece decoration. New Christmas Airblown....3.5 Foot Lighted Christmas North Pole Inflatable. Welcome Santa to town this year with this colorful Candy Cane North Pole Sign Christmas Inflatable. New Air Character Christmas Inflatable. Adorable St Bernard Christmas Inflatable that the whole neighborhood will enjoy. This Handsome St Bernard Decked out in a Santa hat Stands 7 feet tall. A must Holiday decoration for all Bernard lovers and dog lovers in general. Let the Holiday Season begin with this...New 2018...Santa Castle Archway Christmas Inflatable. Very Adorable 9 Foot Whimsical Santa Scene Christmas Inflatable featuring Santa Reindeer, Snowman, and Penguin all looking out their windows and greeting passersby. . This magnificent looking Castle with Santa and friends stands 9 feet tall by 3.5 feet wide. Weatherproof. Inflates in seconds. Easy set-up. New Air Character Christmas Inflatable .....Beautiful and Elegant Siberian Husky Airblown Inflatable. This one is for all you Husky and Dog Lovers. And one of our most popular inflatables ever. Supersize your Holiday Decorating with this large 7 Foot Husky Holiday Inflatable. This huge handsome husky is all decked out for the holidays, and he lights up, and is ready to greet your friends and neighbors. He will definitely be the attraction in your neighborhood this Holiday Season. New Christmas Inflatable.... Snoopy On Fireplace Christmas Inflatable. A great decoration for all you Peanuts fans. Snoopy is bringing you all sorts of holiday cheer on this Fireplace Mantel Scene. Very Adorable Snoopy Decoration including the cookie and milk for Santa! With this airblown you get a complete outdoor scene in seconds all with the greatest of ease. Snoopy is decked out in his Santa hat with his longtime companion Woodstock...to be a sure winner in your neighborhood this 2018 Christmas Season. Almost 7 Feet Tall. Fire and Ice Effects. Santa has a new method of conditioning. This is the inflatable for you if you are bicycling enthusiasts or just looking for a fun Holiday Inflatable for 2017. Looks like Santa is enjoying his ride and wants to wish all your neighbors Christmas cheer. Put this Santa On A Bicycle Inflatable in your yard this year and have some fun celebrating the Holiday Season! New for the Holiday Season 2017......Olaf and Sevn Holiday Scene Inflatable. Greet your guests with these adorable Disney characters Olaf and Sevn. Your holiday season will never be the same as you supersize your decorating with this large 9.5 foot Disney Scene Inflatable. Olaf is animated. It will be a big hit your in neighborhood with young and old alike. New Gemmy 2017 Nativity Christmas Inflatable. Beautiful Kaleidoscope Lighting Nativity Scene This Christmas inflatable stands 6.5 feet tall with the Joseph, Mary, and the Baby Jesus. Young and old will adore this one. Celebrate the Reason for the Season. New Gemmy Christmas Inflatable ......Dog with Gift in Doghouse Christmas Inflatable. Looks like this adorable family dog has received a special gift from Santa...a gift in favorite Holiday colors. This outdoor Christmas inflatable is animated as the dog moves his head from side to side. This Gemmy inflatable extends out 5.5 feet wide. New Santa Sleigh and Reindeer Christmas Inflatable. Ho Ho Ho...Santa is coming town and his sleigh is filled with gifts and merriment. This Colorful Gemmy Inflatable features Santa and his Penguin helper wishing all Christmas joy and cheer. Spread the Holiday cheer with this vibrant and colorful new Christmas Inflatable! This Santa Sleigh Inflatable extends out 8 feet long. New Gemmy Christmas Inflatable back for 2018....Santa in a Large Firetruck with Elf and Dalmatian. This Large North Pole Firetruck Christmas inflatable extends out 7 feet wide Great inflatable to honor all our firefighters and other rescue workers. Let Santa and his pals bring some Patriotic merriment to your yard and neighborhood this year. Make it a ho ho Merry Christmas! Comes with powerful blower to inflate the Airblown and keep it inflated. Grab one today at this great price.....tis the season to be jollly! New Holiday Inflatable. Decorate the yard with this cool looking 8 Foot Penguin Trio Pyramid Christmas/Holiday Inflatable. Our Penguin friends are decked out in their Holiday Scarfs and ready to decorate to help celebrate the Holiday Season. Adorable 8 foot inflatable. Young and old will love this new Air Character's Holiday Inflatable. New Gemmy Dalmatian and Beagle Puppies with Gift Boxes Christmas Inflatable. Heartwarming Dalmatian Puppy Scene will be enjoyed by young and young at heart everywhere. Great for indoor or outdoor use. Lights up for nighttime glow. Stands 5 feet tall. Santa and his pit crew elves are featured in this new Animated Gemmy Christmas Yard Inflatable. Here we have two elves using their their tools as they jack Santa's sleigh up and down. This Santa Sleigh inflatable stands 5.50 feet tall and six feet wide. Be the hit in the neighborhood with all the kids! Great animation and fun! New 2018 3.5 Foot Jolly Ole Santa Christmas Inflatable. Santa Claus is the defining Christmas memory for many children during the holiday season. Christmas just wouldn’t be complete without a visit from Jolly Old St. Nicholas. Great for indoor or outdoor setting. This inflatable features Santa waving to all passersby Christmas Greetings. New unique Christmas Inflatable....Santa coming down the Chimney. Christmas Decorating can be really fun. This animated Santa has gotten stuck at the stroke of midnight. Not good. But this Christmas Inflatable will be the talk of the neighborhood and will surely bring some Holiday cheer and joy to your neighborhood. Santa's head pops up and down. Colorful and very attractive Holiday Christmas inflatable. Stands 5.5 feet tall. Ho Ho Ho.....Santa wants to wish all a Big Merry Christmas with this large Outdoor Christmas Inflatable. This Gemmy Santa inflatable featuring Santa and Elf holding a Merry Christmas Banner extends out 12 feet long. Angry Birds Christmas Scene Inflatable. New Gemmy Inflatable back for Christmas 2018....Angry Birds Christmas Scene Inflatable. Licensed characters from the Angry Bird Movie ready to celebrate Christmas. Wow...it is going to be a good Christmas when even the Angry Birds and the Bad Piggies are in the Holiday Spirit! Salutations "Seasons Greetings" are inscribed into the snowbank. Large Holiday inflatable that extends 10 feet long. Minion Carl from the Minion Movie. Add some fun and humor to your Christmas decorations this year. Kids will love this adorable Minion Inflatable in your yard this Christmas. This Gemmy Christmas inflatable is 4 feet tall. Hey Football Fans..... Check out this Santa Football Scene Christmas Inflatable! Santa is fitted with his new football uniform and ready to show Mr. Moose how to play some football. Looks like the two penguins are scared out of their wits with what might happen next.. Have some fun with your holiday decorating this year with this inflatable. This item can be used indoors or outdoors. Great fun for all your home parties.... put these characters on the deck or in your yard to welcome everyone to your Christmas party or next football viewing event! This Gemmy Holiday inflatable extends 6.5 feet wide. 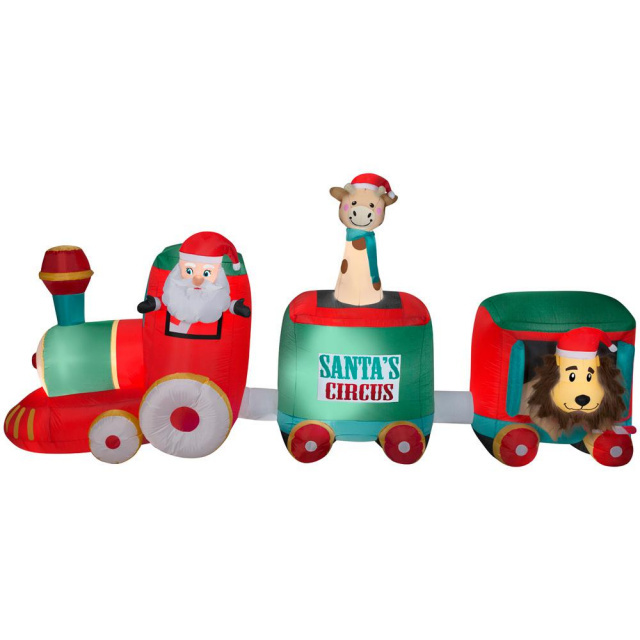 New Fun Time Gemmy Holiday Inflatable ...All Aboard The New Santa Train Express Airblown. This is a fun 11 foot Christmas Blow up Airblown. Great center piece for your Christmas Yard decorations. Get on board with Santa and all his merry friends Snowman and Penguin in the tow this 2018 Christmas Season! Don't forget to tell Santa to Stop By Your House. New colorful Christmas Ornamental Inflatable to grab Santa's attention. Light up the Christmas Season with this 3.5 Foot Christmas decoration with internal lights for nighttime display. Kaleidoscope Green Tree Christmas Inflatable. Add some style and elegance to your Christmas and Holiday Decorating. Dazzle your neighbors with this new beautiful Christmas Tree Inflatable for the 2018 Holiday Season. It will be the talk of the neighborhood! Click on the above link to see video of this Kaleidoscope tree. Gingerbread Man Christmas Inflatable. Large 7 foot Gingerbread Man full of Christmas Joy and Fun. Unique Christmas Inflatable. Decked in his Santa hat....this Gingerbread Man is ready to celebrate the Holidays. Grab one today! New Animated Penguins Ice Fishing Christmas Airblown Inflatable. Looks like our Penguin friends has had some luck in their fishing endeavors. Guests and neighbors are sure to enjoy this animated inflatable. Colorful and unique five foot wide animated Holiday Gemmy Inflatable. Wonderful Christmas decoration for all you winter fisherman...and especially for those with kids! Support the Troops for Christmas! Gemmy Christmas Inflatable....Honor the military and welcome home the troops for Christmas with this Military Santa. Make your son or daughter or neighbor proud with this welcoming Santa. Will create lasting memories. This Santa stands 7 feet tall and will make a great statement. New Gemmy Christmas Inflatable ....Disney Mickey and Minnie Decorating Snowman. These two adorable Disney Characters adorned with Santa Hats are decorating a dapper looking snowman. Gemmy 6 Foot Wide Holiday inflatable that will bring a lot of joy this Christmas Season. Santa Goes to Hollywood in his new Limo. Supersize your Holiday Decorating with this Hollywood theme inflatable where Santa has grabbed Mrs. Claus and friends and got a limo to do sight seeing in Hollywood. This fun time Christmas Airblown extends out 10 feet long! Guaranteed to put smiles on the faces of all passersby. Olaf is back for the Holidays.. This handsome looking Olaf stands 6 feet tall and features blue and white kaleidoscope lights and has a present for the Holidays. This Olaf will be a lot of fun and will grab the attention of neighbors and passersby...all will want to join in on the Holiday Spirit. Get ready...here comes the Minions for the 2017 Holiday Season. Let This 3.5 foot cute fellow decked out in a Santa Hat be part of your Holiday decorating and fun. Stuart is ready to celebrate the Holidays! One of the more elegant and creative designs for Christmas inflatables. With two handsome standing nutcrackers, Santa and the redbird simultaneously pop out of the clock creating a wonderful Christmas scene. Animated Outdoor Christmas Inflatable extends 5 1/2 feet long by 6 1/2 feet tall. Tis the season to be joyful and merry! The Minions Decorating a Large 6 Foot Christmas Tree. Our crazy bunch of Minions are ready to celebrate Christmas with their own Minion Christmas Tree topped with with a star. All The Minions are decked out in their Santa hats are ready to celebrate the 2018 Holiday Season with you right in your own front yard. Grab this inflatable today. New projection kaleidoscope Cinderella Holiday Inflatable for 2016. This Very attractive StoryTale Cinderella will create special magical Christmas memories for your children this joyous season. This cinderella airblown stands 5 feet tall. Bring alive the magic of Disney this Holiday Season. New from Gemmy....Santa and Reindeer by the Campfire Roasting Marshmallows Christmas Yard Inflatable Decoration. Kaleidoscope lighting creates a flickering light effect in the fire. This good times campfire scene will be enjoyed by young and old alike. This Holiday Christmas inflatable is 4.25 feet high. New Gemmy Christmas Inflatable back. This new Christmas Inflatable features a Jolly Ole Santa Standing a whopping 12 feet tall and holding a candy cane and gift package. Guaranteed to be a hit in the neighborhood and bring some ho ho ho Christmas cheer to those passing by. Large Christmas inflatable extends 6.5 feet long and 12 feet tall. New Gemmy Christmas Inflatable.... Santa's Pirate Ship Airblown Inflatable. Santa and his fun loving friends are all decked out in their pirate gear, and are ready to celebrate a grrrr style Christmas. Large Holiday inflatable extends out 8 feet long. Snoopy is all decked up in his Santa Suit and Hat and is ready to celebrate the Holiday Season. Ho Ho Ho...This lovable Snoopy is standing 3.5 feet high...and is ready to bring some Christmas cheer to your neighborhood this Christmas Season. Wow...Most adorable and romantic Christmas Inflatable....Cinderella's Castle using projection kaleidoscope technology. Lots of oooohs and ahhhs on this new Gemmy Christmas Inflatable! This adorable outdoor inflatable scene will delight your holiday guests and neighbors alike. Almost 5 feet wide and 8 feet tall. Be the first in your neighborhood to have this very special Christmas Airblown. Gemmy Christmas Scout Elf on a Fireplace Inflatable. For all you Elf on the Shelf Fans, this is the Elf Christmas Decoration for 2018. This adorable figure will help brighten up the Holiday Season with this colorful Fireplace Christmas Scene. This inflatable stands 6.5 feet. New St Bernard Christmas Inflatable. This handsome St Bernard Dog Stands 9 feet tall. And this St Bernard is decked out in his Santa Hat and is ready to wish all Christmas greetings and joy this Christmas 2019 Season! A must have for all you St Bernard fans. Limited Edition and Rare Peanuts Snoopy Inflatable. This Indoor/Outdoor Snoopy Christmas Inflatable stands 6 feet tall. Snoopy is holding a Christmas Stocking with a candy cane. Snoopy is decked out in his Santa hat and blue scarf. New Holiday Inflatable .....Twinkle 8 Foot Snowman. This dapper looking snowman is ready to sparkle and twinkle in your yard this year to help you celebrate the Holiday style and fashion. This inflatable stands 8 feet high. This Snowman inflatable lights up and inflates in just seconds. Awesome looking Twinkle effect to greet all your Holiday guests. Back for 2018.....Santa Presents his new North Pole Stable Christmas Inflatable. Santa has a full display of his reindeer together in this new stable.....Including On Donner, on Comet, On Cupid, On Blitzen. This Santa Claus inflatable has internal lighting for night display and has a weather resistant design which is great for indoor/outdoor use. This large Santa Inflatable extends out 11 feet long! New Christmas Inflatable....This Gemmy Snow Couple Inflatable features our handsome Snow Man Couple all decked out in their Holiday Best doing some Christmas Shopping. Looks like they have had some success in their shopping excursion with the bags they are holding in front of the light pole. This inflatable stands 6 feet tall. New design Gemmy Holiday Inflatable.....Neon Snowman and a Penguin on a Holiday Scooter. Looks like our friends are off to do some Holiday partying with a gift to boot. Our merriment friends feature a sign on their scooter that says "Holidays on the Go!" This inflatable is over 5 feet long and 5 1/2 feet tall. There is no internal lighting with this inflatable. But, this inflatable comes with a spotlight fixture with an LED blacklight that shines on the inflatable to make it glow in the dark. Can also look great in the daytime! New Colorful Santa in His New Vintage Firetruck Christmas Inflatable. Wonderful Christmas Scene as Santa is driving the North Pole Firetruck with his Dalmatian friend on top. This Gemmy Christmas Inflatable extends out 6 feet. Quick and easy to set up. 7 Foot Toy Soldier Holiday Inflatable. Theme inflatable from the Nutcracker Musical and Ballet. New Christmas Outdoor Inflatable back for 2018....Hey Snoopy Peanuts Fans.....Supersize your Christmas decorating with the very large 10 foot Snoopy Christmas Inflatable. Snoopy is featured here holding his buddy Woodstock in a Christmas stocking. Charles M Schultz licensed product. Another new exciting inflatable for all you Peanut's Fans! The most famous beagle of all and his small bird friend are here to wish you a very Merry Christmas. Celebrate this Christmas with your Peanut friends. Back for 2018....6 Foot Christmas Nativity Scene. This Christmas Nativity Inflatable has a different design compare to your traditional Nativities. This Nativity features the Holy Family standing with Mary holding the Baby Jesus. Traditional Nativities feature the Baby Jesus in a creche with the Holy Couple and others surrounding the creche. Remember the reason for the season. Traditional animals included. Heartwarming and Adorable Christmas Disney Mickey and Minnie on Sled Inflatable. This adorable Christmas inflatable extends five feet long and is guaranteed to create lots of ahhhhs. And this inflatable will bring out the maximum Holiday spirit from all those who pass by. Deck your yard this Christmas Holiday Season with this Disney LED Lighted Family Inflatable. All aboard the new Santa Christmas Train. Santa has gotten a new train this year to deliver a train load of presents along with his trust worthy Penguins assistants. It looks like they are having some fun along the way. Great centerpiece for your Christmas yard deocorations. This large train extends out 20 feet. These cute and adorable penguins will delight all who check out this Christmas Inflatable. Click on the link above for larger picture. Very adorable Elf Christmas Inflatable. It seems our North Pole Elf did some improvising on the stop sign requesting for Santa to stop at his location. The cute elf stands 5 feet tall. Let this Elf Christmas Inflatable add to your Holiday Fun and Merriment! New 7 foot Nutcacker Christmas Soldier. This fine looking Nutcracker soldier is decked out in his best red coat and black boots. You can almost hear the famous Nutcracker theme song with this dapper looking Nutcracker. So decorate in style for the holidays with this Nutcracker Inflatable. Rudolph The Red Nose Reindeer In Santa Suit Christmas Inflatable. Over 5 foot Christmas inflatable. Internal Lights will really light up the night with the presence of our famous reindeer friend. Rudolph boasts a colorful Santa Jacket and Hat. Vistors will love this adorable Rudolph inflatable in your yard this Christmas Season. Supersize your Christmas Decorating with this large 12 Foot Santa Train Inflatable. Santa will greet all your visitors and passersby with a large Christmas greeting with his train filled with gifts decorations. Bring some Christmas joy and merriment to your Christmas decorating this year with this colorful Christmas Inflatable. All ages will enjoy this inflatable! 6.5 Foot African American Santa Clause Christmas Inflatable. Celebrate the Christmas Season with this Large Jolly Ole Inflatable Santa with his arms extended and gift in hand and ready to greet all your visitors with some big HO HO HO's. Grab one today. Spider-Man Sitting on chimney Christmas Inflatable. Let this web-slinger Spiderman entertain your guests and visitors this Christmas Season. This marvel licensed product stands 3.5 feet. A must have Holiday Inflatable for you Spiderman Fans. Everything included for easy set-up. Kids Favorite Character from the Disney Movie Frozen.....Olaf Snowman Holiday Inflatable. Let this cheerful and lovable looking Olaf Snowman with Santa Hat and Scarf brighten you up your Holiday Season. He stands 3.5 feet tall. New 2018 Holiday Yard Inflatable Decoration....Cute Cat with Santa Hat. This 3.5 foot darling Cat is ready to celebrate the Holiday Season with you. This adorable looking cat is decked out with a red Santa hat and green bow tie. This Cat Holiday Inflatable decoration is for indoor and and outdoor use. Internal lights create a glowing night-time display. New for 2018 Christmas Yard Decoration.....Beautiful LED Lighted Fuzzy Husky. Elegant looking and designed Siberian Husky Holiday Yard Decor will be a delight to Husky and dog lovers. Let him greet guests at your front porch for a warm Holiday welcome.. Pre-lit with 120 warm white LED lights to create a sparkling glow. Santa in a Hammock Christmas inflatable. Looking for a new fun Christmas Inflatable that will bring out some laughter and Christmas Cheer this Christmas Season....then this inflatable is for you as Santa is snoozing or maybe snoring??? in his hammock. This fun loving Gemmy inflatable is six feet long and 5 feet tall. New Gemmy Inflatable back for 2018.....Animated Santa Dancing the Hula Christmas Inflatable. Bring some fun and merriment to your yard this Christmas Season as Santa is enjoying some R & R and is showing off some of his hidden talents at the Beach. Santa is all decked out in his Tropical outfit. This inflatable stands 6 feet tall and has internal lighting to light up the night. An old Holiday Christmas Favorite is Back......Snoopy The Flying Ace with Woodstock on his Doghouse Inflatable. Snoopy is all decked out in his Santa Gear. And his doghouse is decked out for the season. This Christmas Inflatable stands 4 feet tall. Santa hanging from gutter Christmas Decoration. Ho Ho Ho....Give you neightbors and guests a laugh with this Santa Hanging from the Gutter. Santa extends out 5 feet long. The decoration does not inflate. Display the Reason for the Christmas Season in your your yard decorations this year with this 20" Rope Light Jesus is the Reason Motif. Brightly colored lettering that will light up your night time decorations with an added touch of some holly green to the lettering. For our New 2015 and More Of 2016 and 2017 Christmas Inflatables, click here.